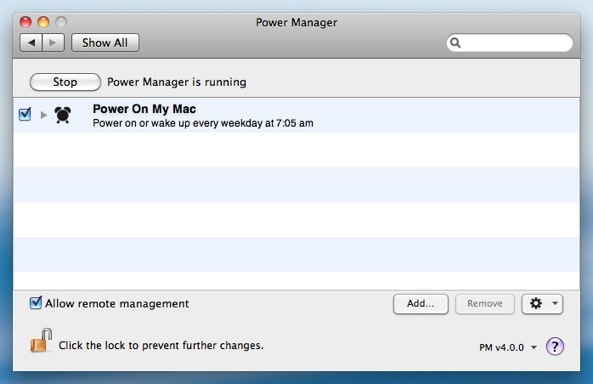 Mac computers have the ability to automatically power themselves on. 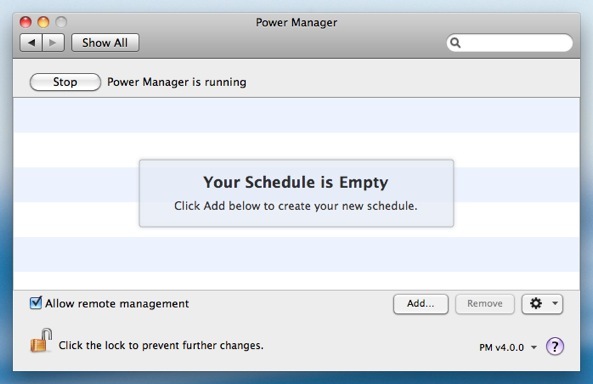 A switched off, shut down, Mac can be scheduled to start up at a specific date and time. This ability is present in all modern Mac computers. 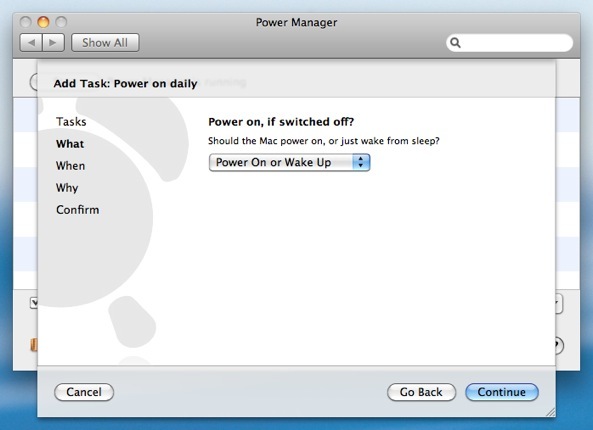 Mac computers can also wake themselves up from sleep mode. Sleep mode is the state your Mac enters after it has not been used for a while; the display switches off, the hard drive spins down, and the small white light on the front of the computer pulses gently. 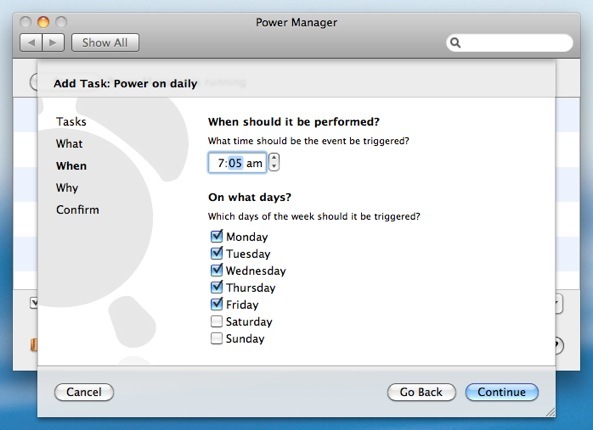 Power Manager lets you schedule when your Mac powers on and wakes up from sleep. 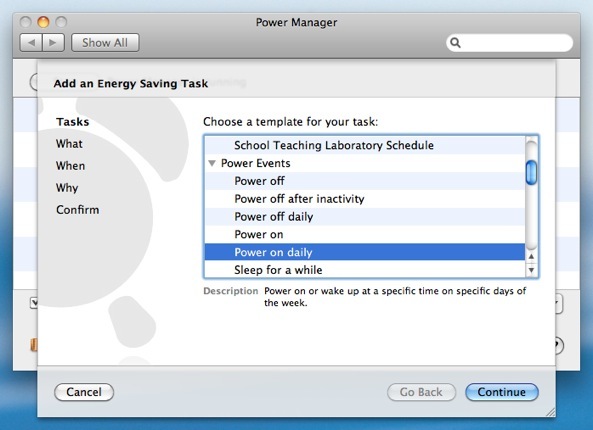 Launch System Preferences and select Power Manager. Click "Add…" to create a new event. Choose the template "Power on daily". Click Continue to the "What" step. Click Continue to the "When" step. Adjust the time and days to match your needs. Continue through the remaining steps until your event is created. Your power on event is now scheduled and ready to run. If you need to schedule additional times and days, add another event. You can build up sophisticated schedules by combining multiple events. This article was posted in Energy saving, PM4, Power Manager, and Recipe and tagged dssw, Energy saving, Power Manager, power on, schedule, and start up.